Tintern Abbey (Cadw)01291 689251work Historic SiteThe appeal of this exceptional Cistercian abbey remains as enduring as ever. An area of outstanding beauty complemented by this outstanding beauty in stone. If only the walls could talk! The chants of countless monks echo through the masonry here. Despite the shell of this grand structure being open to the skies, it remains the best-preserved medieval abbey in Wales. Although the abbey church was rebuilt under the patronage of Roger Bigod, lord of nearby Chepstow Castle, in the late 13th century, the monastery retains its original design. The lands of the abbey were divided into agricultural units or granges, worked on by lay brothers. 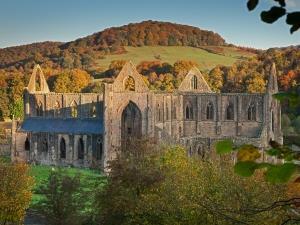 On September 3, 1536 Abbot Wyche surrendered Tintern Abbey to King Henry VIII’s officials and ended a way of life which had lasted 400 years. The appeal of this exceptional Cistercian abbey remains as enduring as ever. An area of outstanding beauty complemented by this outstanding beauty in stone. If only the walls could talk! The chants of countless monks echo through the masonry here. Despite the shell of this grand structure being open to the skies, it remains the best-preserved medieval abbey in Wales. Although the abbey church was rebuilt under the patronage of Roger Bigod, lord of nearby Chepstow Castle, in the late 13th century, the monastery retains its original design. Free on site parking, Cycle stands on site/nearby, Exhibition, Portable induction loop. 1 March - 30 June 2019 Daily 9:30am - 5:00pm. 1 November 2019 - 29 February 2020 Monday to Saturday 10.00am - 4.00pm, Sunday 11.00am - 4.00pm. M4 Eastbound Junction 23 & M48 or Westbound Junction 21 & M48. Leave the M48 at Junction 2 & A466 for Chepstow; continue on this road (signed for Monmouth) to Tintern and Abbey signed to right.